Colleville-sur-Mer is known for its immense American military cemetery. The former "Omaha Beach" is also a very pleasant holiday destination, far from the bustle of the fashionable seaside resorts. At the seaside you can find a long sandy beach in a beautiful landscape of cliffs with pleasant pathways for walking. 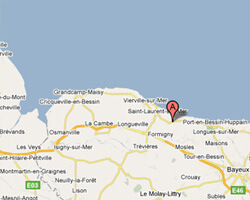 In Colleville-sur-Mer enjoy a seaview holiday rental. 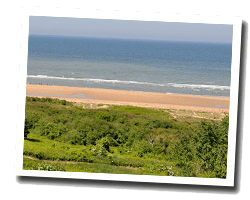 In a preserved green area near a sandy beach, above Omaha Beach, in a leisure residence, semi-detached bungalow with Terrace and outdoor furniture, shared laundry, children's play area, choice of activities in the residence. Price from 600 € to 1300 €. Price from 700 € to 1600 €. 3 rooms House 100 m2. Terrace, shared garden with outdoor furniture and barbecue. View of the sea and the cliffs. Direct access to the sandy beach. 2 Bedroom(s), 1 double bed(s). Final cleaning : 40 €.